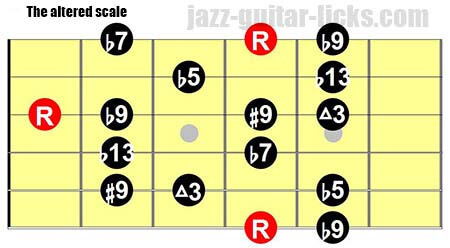 The altered scale is the seventh mode of the melodic minor scale. It contains one altered fifth (b5), two altered ninth (b9 and #9) and one altered thirteenth (b13). This scale is used to solo over Dominant chords when you want to create tension in your jazz lines. The altered scale is sometimes referred to as super Locrian mode or Locrian b4. How To Play The Altered Scale On Guitar? There are many ways to play the altered scale on a guitar. Here are two patterns. The first one have roots on the sixth and first string whereas the second have roots on the fifth and second string. To "hear" the sound of this scale it is important to play these shapes starting from the root "R". Remember that you have to learn and transpose these patterns in twelve keys by moving the root "R" to the desired note keeping the same intervals. The altered scale is so-called because it contains all four common altered notes generally used to add tension when soloing over a dominant chord. These four notes altered notes are b9 - #9 - b13 - b5. You need to know that the altered scale sounds good with other altered chords as 7#11 or 7#5, indeed the b5 can be considered as a #11 and the b13 as a #5. In conclusion, every time you see a dominant chord for example, in a II-V-I sequence, you can play an altered scale over the V to create a little bit of tension. 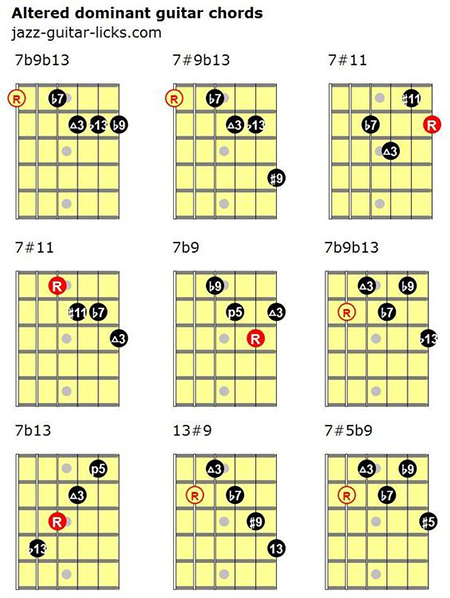 Here are some guitar neck diagrams of altered chords that fit with the altered scale. In this example, we will apply a minor triad on G7alt to create a strong pull towards CMaj7. Playing a minor triad starting on the b9 of a dominant chord highlight some interesting altered notes as the b9, b13 and #9. 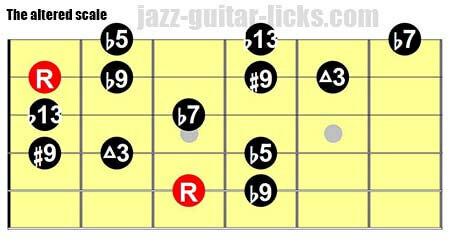 This means that in a II-V-I progression in C major you can play an Ab minor triad over G7alt. If you have carefully read the previous section of this lesson named "RELATIVE CHORDS" you will understand that you can play a G7b9 chord, or a G7b13, a G7#9 or even a G7b13#9. How To Play an Altered Lick Using The Dominant Pentatonic Scale? You are probably wondering what's the dominant pentatonic scale. It contains the four notes of a dominant chord namely root (1), major third (3), perfect fifth (5) and minor seventh (b7) with a supplementary note, the second (2) which can be seen as the ninth (9). The dominant pentatonic scale is commonly used over dominant 7 chords starting on the root, but can be used as a tritone substitution, this where it gets very interesting. Indeed, when playing a Mixolydian pentatonic scale starting on the b5 of a dominant chord you highlight three altered notes, the b5 (aka #11), b13 and b9. The following example takes a major II-V-I progression in C major. You can notice the use of the Db7 dominant pentatonic scale over G7. This creates an interesting sound and a bit of tension.